The highest point on the Travers Range, with routes accessible from either the upper Travers Valley or Summit Creek. Gain the ridge from the junction of the creek with the Travers River, or more easily from Summit Creek via scree or snow slopes, left of a buttress. The ridge gains height gradually in a series of steps, then becomes narrow and broken. Eventually the upper basin in Summit Creek route is reached. Do not traverse onto the steep and loose east face. A relatively easy summer route. From the Travers valley, follow the true left bank of Summit Creek into a tussock basin (small campsites here). Climb a wide gully between the north-east ridge and north buttress over tussock, scree and easy slabs. 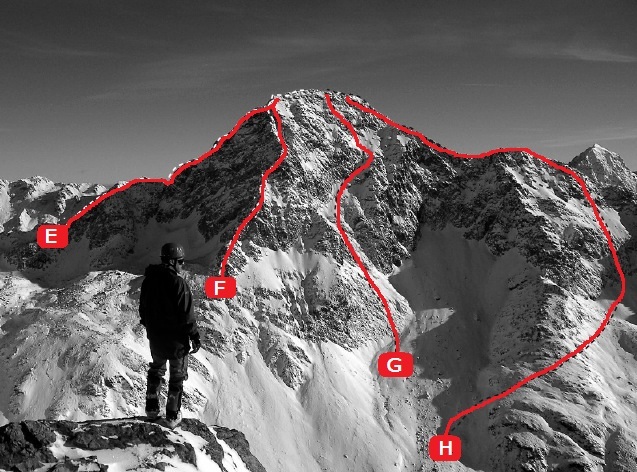 From an upper basin which usually holds snow, angle south-west to the summit ridge and the final climb to the summit. Alternatively, climb scree west of the north buttress till below the peak, then easy loose rock to the summit ridge. A climb recommended for experienced climbers only. Follow Summit Creek route to scree 200m above the toe of the buttress to a narrow couloir rising steeply from scree to crags above. A four metre step near the bottom requires friction holds. Above a ledge the couloir is walled by loose rock. Once on the buttress follow the jagged ridge around the upper basin rim to the summit. Note: Grade is unconfirmed. The ridge begins from Travers Saddle. Initially climb rotten rock to a deep notch. Climb steep rock via a crack (2 pitches) angling on to the Sabine side - a rope will be needed. Solid slabs then give good climbing to the summit. An excellent summer route. Climb the lower snowfield in the centre of the face, then angle up right close beside the buttress below and right of the upper snowfield. Five 60m pitches to reach the South East Ridge just below the crux of that route. These ribs separate the east, south and south-east faces of Travers. The principal difficulty is a rock step near the top, above where the ribs join. Climb it direct or turn it via a steep ramp. Once on the south ridge easy slabs lead to the summit. This face of steep loose rock has been ascended, but is not recommended as a descent route. Note: Grade is unconfirmed. Cross the river and ascend the scree opposite the hut. 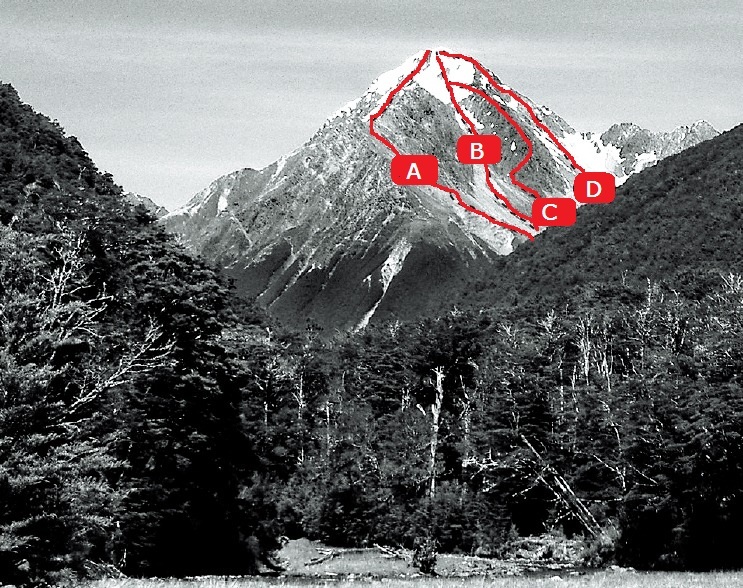 Cross a broad south-east falling tussock spur, below a buttress, and sidle into the next basin to the north-east. From the head of this basin follow ramps and ledges onto the ridge, then North East Ridge route to the summit. This is a good descent route.